An exhibition of new paintings by Thomas Langley. In collaboration with five contemporary galleries, Langley shows works from his on-going series ‘Mummy’s boy’, for the first time in a dedicated solo exhibition. 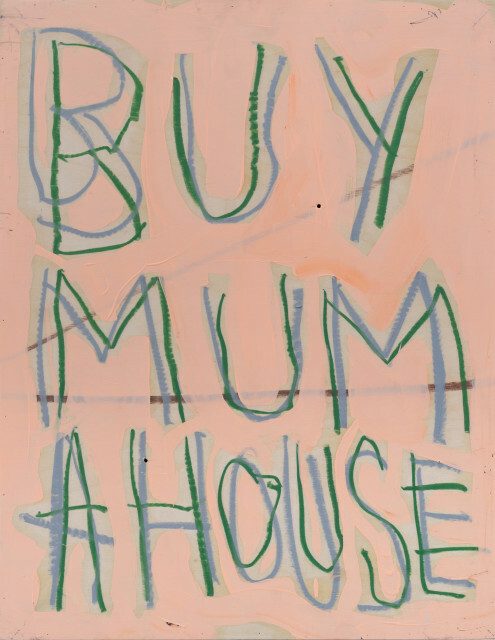 Having started this nonsensical paradoxical quest to ‘buy mum a house’ during his studies at the Royal academy schools, Langley now fully fledged, flexes this newfound artistic adult hood with a solo show hosted by Cob Gallery. Large-scale text-based paintings sit alongside newly developed representational landscapes. This exhibition marks a completion in what until now has been an on-going series. Thomas Langley (b. 1986, UK), lives and works in London. Solo exhibitions include: Mega Alright Part II, Union Gallery, London, 2019, Just like anything, Marian Cramer, Amsterdam, 2018, Solo booth at Art on Paper, Marian Cramer, Amsterdam, 2018, Big Windows, The Arcade Project, London, 2018, Plastic Factory (no place for me), 12 Piccadilly arcade, London, 2018, (Pipe) Dreamer, Royal academy schools graduation show, London, 2018, Future Absurdities, Unit 1 Gallery Workshop, London, 2017, Art Type Stuff, Stour Space, London, 2016.